The test of true fashion talent is time. San Francisco-based Julie Chaiken never felt the need to broadcast her eponymous Chaiken line in big, bold lights. Instead, she's had steady double decade success. Known for the perfect fit pant, Chaiken left fashion's sonar for a little while there. But the fashion world always loves a comeback. Cue Chaiken & Capone. The original name of the brand, Chaiken bought out her business partner Pamela Capone in 1998 and dropped the double name. With a re-launch earlier this year, and an introductory Spring '11 collection, the double name is back. Still work wardrobe oriented, the new school of Chaiken has high-octane polish. When denim dominated the Spring runways, Julie thought it was ample time to reinstate the perfect, non-denim pant. A preview of the Fall '11 collection reveals paired down professional basics with a sharp edge. 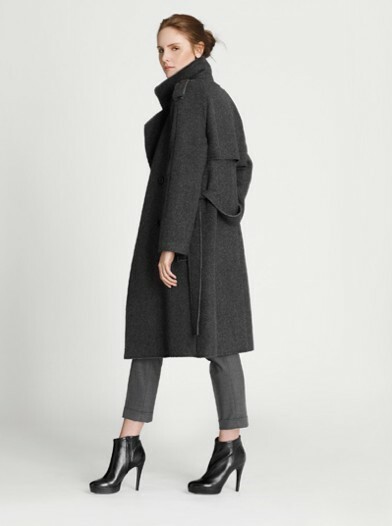 Form-fitting shift dresses, tailored outerwear, cozy knits, and cropped pants elevate the brand to cool classic. The trendiest outfit — a sheer black blouse paired with cropped pants and an oversized sweater — will outlive seasonal flightiness. Watch out Theory, Chaiken's back in town. Chaiken & Capone, available at Barneys New York and CUSP by Neiman Marcus. Online shop coming soon. Samantha Durbin (sami.7x7@gmail.com) is a lifestyle writer who honed her blogging skills as Editor of FabSugar.com. Samantha graduated from The Fashion Institute of Technology, and also writes for San Francisco magazine and Gilt City.